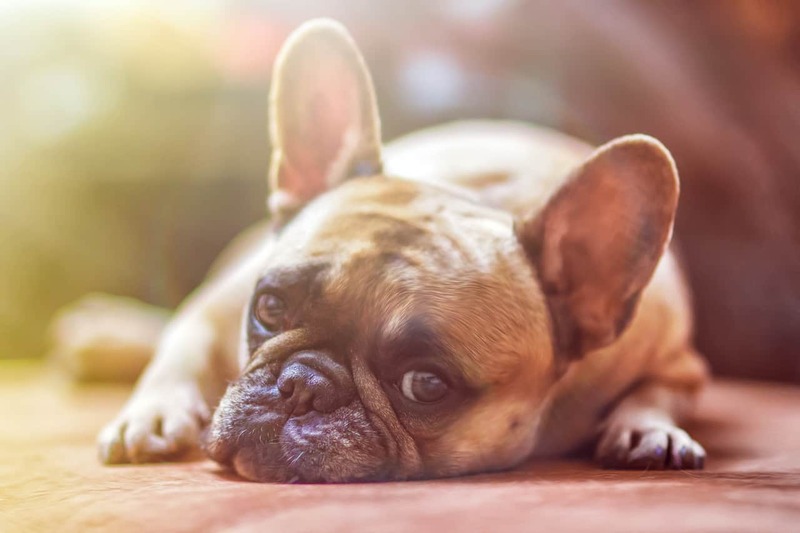 Dogs who have severe chronic ear disease in both ears may not show obvious signs of ear infections, as they have become accustomed to the discomfort. The ear is divided into three components: the external, middle and the inner ear. The external ear consists of the outer cartilage and ear canal down to the ear drum. The middle ear exists between the ear drum and the cochlea (hearing part of the ear). It contains fluid and very tiny bones known as auditory ossicles, that conduct vibrations from the ear drum to the inner ear. The inner ear is composed of a bony labyrinth of tunnels including the cochlea. In the inner ear sound vibrations are converted into nerve impulses and transmitted to the brain. Inflammation of the ear is known as ‘otitis’. We classify otitis according to the location of this inflammation- otitis externa (external ear), otitis media (middle ear) or otitis interna (internal ear). What causes itchy ears in dogs? Often dogs are diagnosed with secondary yeast or bacterial ear infections. In almost all these cases the bacteria/yeast involved is not the primary cause of ear disease. Something else has occurred within the ear that unbalances its natural defences and allows the yeast or bacteria to grow. It is important to work with your veterinarian to identify the underlying cause, otherwise, ear infections could become an ongoing issue for your dog. What happens if ear infections are left untreated? Having an ear infection is a very uncomfortable experience. The itchiness caused by infected ear canals can be unrelenting. The ear canal becomes inflamed and thickened. Permanent changes to the anatomy of the ear can occur, including narrowing, which increase the likelihood of future ear infections. Build up of waxy discharge in the ear can result in partial deafness. If the infection spreads to the middle or inner ear complete deafness can result. Dizziness and motion sickness can occur in the case of middle or inner ear infections. How to treat itchy ears in dogs? Your veterinarian will perform a thorough ear examination and question you as to the history of the ear disease and the overall health of your dog. A swab of any discharge present will be taken and examined under the microscope to determine the bacteria/fungi involved. This microscope examination is essential to determine appropriate treatment for your dog. Treatment will be selected based upon the results of this examination. Current infections may be different to those your dog has had in the past, and each ear can carry a different kind of microbe. First-line treatment often involves the use of an antibiotic ointment in the ear. Use this product for the full duration even if you notice the infection has cleared after a few days. Once the recommended time has elapsed, return to your vet so they can perform another microscope exam and check that the infection has been cleared. As mentioned earlier, usually ear infections occur secondary to another disease process. Based on the history you provide and their examination of your dog, your vet will attempt to identify the underlying cause of the infection. Treatment may range from flea control to surgery depending on your vet’s diagnosis. At Southern Cross Vets we now offer endoscopic deep ear cleaning. Your vet may suggest that your dog undergoes an endoscopic exam if they suspect that he/she has a foreign body stuck in the ear, or if your dog has a history of chronic hard-to-manage ear infections. Deep ear flushing allows for the removal of debri plugs deep within the ear canal which may have shielded bacteria from antibiotic ear ointment. The procedure is done under a full general anaesthetic. An endoscopic exam is performed by inserting a small specialised camera and light into the ear canal to closely examine the inside of the ear. Endoscopy is a great way to comprehensively assess the entirety of the external ear canal and ear drum, much of which can be difficult to observe in a conscious animal. It allows for the identification, sampling and removal of foreign bodies, masses and obstructive clumps of discharge. Deep gentle flushing of the ear canal is performed to remove any debri. Most dogs recover well from this procedure and can go home on the same day it is performed. If your dog has itchy ears, book an appointment online, or call Southern Cross Vet for a consultation with our award winning vets.